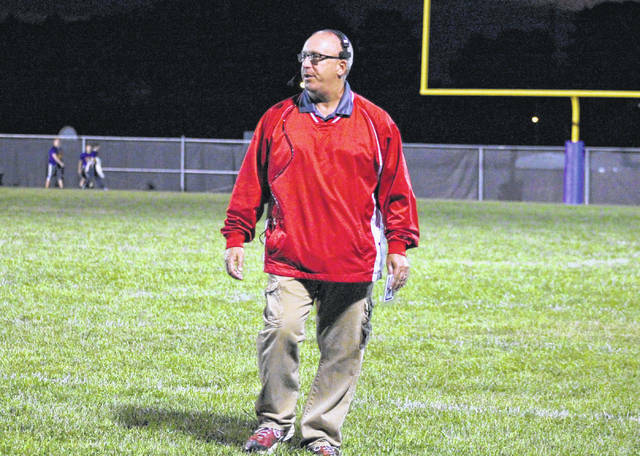 Wahama head coach Dave Barr walks on the field during a break in the action, in the White Falcons’ double-overtime loss on Sept. 8 in Racine, Ohio. MASON, W.Va. — The White Falcons came into the game with a playoff mentality, and now they’re ready for the Super Bowl. The WHS football team earned a 14-7 victory over Tri-Valley Conference Hocking Division guest Miller on Friday night at Bachtel Stadium, in the White Falcons’ home finale which was deemed Wahama’s playoff game by head coach Dave Barr a week ago. Wahama (4-5, 4-4 TVC Hocking) — which has won of three straight games for the first time since 2014 — was forced to punt after six plays on its first drive of the game. However, Miller (6-3, 4-3) — which had won six of its last seven decisions, including three in a row — was also stopped on its first drive and punted back to WHS after six plays of its own. The White Falcons’ next drive was lasted through the end of the first quarter and featured a pair of third-and-long conversions. On the second play of the second period, WHS senior Christian Thomas capped off the 12-play, 83-yard drive with seven-yard touchdown run. The point-after kick was made by Christopher Hesson, giving the hosts a 7-0 lead with 11:15 left in the first half. After a punt by each side, the guests broke into White Falcon territory for the first time of the quarter with eight minutes left. The Purple and White converted a third-and-12, and eventually advanced the ball to the Wahama 10-yard line before WHS senior Coltyn Hendrick intercepted a pass. Wahama made it out of the shadow of its own goalpost to the 32-yard line before having to punt back to MHS. The visiting Falcons were back in the red zone after five plays, but a delay of game penalty moved them to the WHS 22. From there, Miller came up empty on four straight pass attempts, leaving the guests behind 7-0 at the half. MHS got the ball first to start the second half and the hosts covered 30 yards in six plays. On a fourth-and-one from the WHS 42, Miller had enough yardage for the first down, but fumbled the ball away, as Hesson recovered for the hosts. Wahama turned the ball over on downs at the MHS 43-yard line, but Hendrick intercepted another pass on Miller’s first offense play. Miller’s defense wasn’t to be outdone, forcing a three-and-out and then blocking the punt, which left the MHS offense with just 19 yards to go. The guests converted a fourth-and-two from the WHS 11-yard line and were then faced with a first-and-goal from the nine. After a one-yard carry on first down, Devon Crabtree made his way to the endzone with an eight-yard run on second down. Lucas Dishong made the point-after kick, tying the game at seven with 1:29 left in the third quarter. The game was tied for a mere 24 seconds as, on Wahama’s first play from scrimmage, Thomas broke a 65-yard scoring run. Hesson’s point-after kick gave the Red and White a 14-7 lead with 1:05 remaining in the third. Miller’s offense took the game into the fourth quarter before punting back to WHS with 11:13 to go. The hosts ran more than four minutes off the clock before having to punt back to Miller with 7:01 remaining. The guests were backed in two plays, but converted a third-and-18 to keep the drive alive. After a three-yard run on first down, three consecutive MHS passes fell incomplete, giving Wahama the ball back with 4:17 to play. The MHS defense came up with the big play it needed to get back in the game, however, as the Purple and White recovered a White Falcon fumble on the WHS 46 with 3:27 left. Following a defensive pass interference penalty, Miller made it into the red zone with a nine-yard Colby Bartley run. The guests earned a fresh set of downs and were 15 yards from paydirt after a four-yard run by Bartley. However, a pair of penalties sent the Purple and White all the way back to the WHS 35. Wahama senior Johnnie Board sealed 14-7 victory for the hosts by intercepting a MHS pass with 1:25 to go. For the game, Wahama outgained Miller by a 262-to-227 count, including 223-to-160 on the ground. The guests held a 15-to-11 edge in first downs, but the Red and White earned a 4-to-1 win in the turnover battle. The White Falcons were 5-of-11 on third down conversion attempts and 0-for-1 on fourth down, while MHS was 6-of-14 on third down and 1-of-6 on fourth. Both teams were set back 30 yards in penalties. The WHS rushing attack was led by Thomas with 19 carries for 155 yards and two touchdowns. Colton Arrington earned 52 total yards, combining 11 carries with two receptions, while Brady Bumgarner came up with 24 yards on five carries. Bryton Grate, who completed 1-of-3 pass attempts for 16 yards, ran three times for a total of 15 yards. Hendrick was 2-of-2 passing for 23 yards in the win, while Jacob Warth hauled in one 16-yard pass. Board led the Wahama defense with eight solo tackles, three for a loss, and one interception. Arrington, Thomas and Kyle Marr finished with six tackles apiece, including one for a loss by both Thomas and Marr. For the guests, Bartley was 5-of-12 passing for 57 yards, to go with 29 yards on five carries. Blayton Cox finished with a team-high 98 total yards, combining 10 carries with a game-high four receptions. With 12 carries and one reception, Crabtree had 56 total yards and the guests’ only touchdown, while Levi VanBibber rushed twice for 19 yards. Zach Waldrop was held to 15 yards on nine carries, while completing 1-of-8 pass attempts for 10 yards. Alec Eveland rounded out the MHS offense with a 10-yard reception. The White Falcons are now 7-1 against Miller in all-time meetings. Wahama will have the customary week off before its Super Bowl, in which the White Falcons visit Buffalo on Nov. 3.